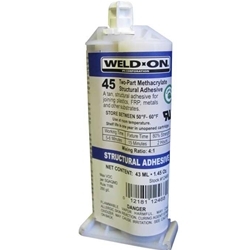 SciGrip Weld-On #45 is recommended for a variety of applications and industries including sign assembly and other fabrication and manufacturing uses where high bond strength and environmental resistance is required. This adhesive is especially suitable for bonding aluminum, CRS, brass, copper, galvanized steel and other metals. Excellent adhesion is also obtained on plastics such as PVC, polycarbonate, ABS, acrylic and PETG. This structural adhesive should also be considered whenever bonding wood or other cellulosics, as well as when working with ceramic and masonry substrates including brick and concrete.